It's the most wonderful time of the year! Christmas is my very favorite holiday. 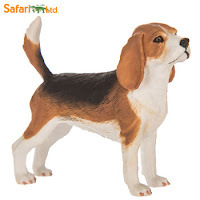 It's time to start thinking of the perfect gift for your children. 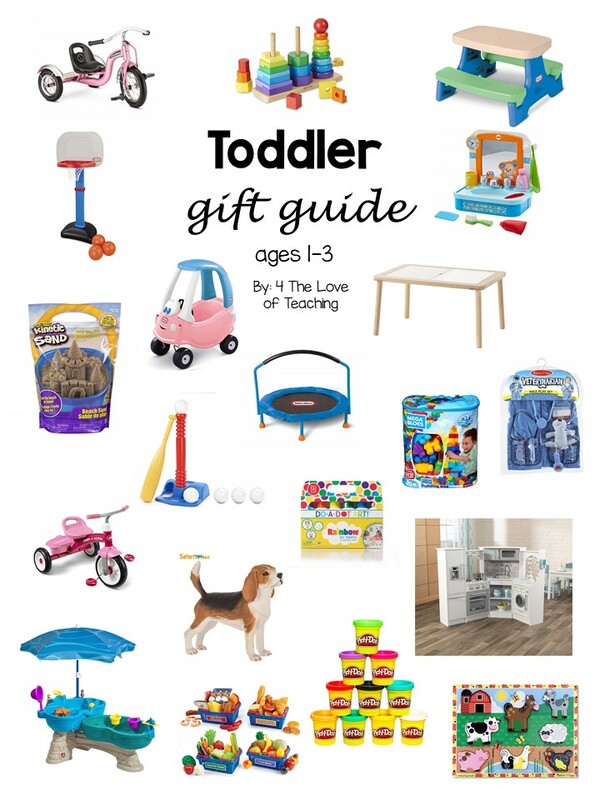 First, I am sharing a gift guide for toddlers ages 1-3. Be on the lookout for my next post, which is geared for older boys ages 8-9. Zoo - Purchase a family membership to your local zoo for year-round fun! We have found this to pay for itself after only a few trips to the zoo and is well worth the price! Plus, everyone in the family gets to enjoy! Children's Museum - We love our children's museum and go often! It was well worth the price for a family membership so we could go as often as we wanted. This is great for those cold months that we are indoors the majority of the day. Other museums - If you have other museums in your area, whether history museums or science museums, family memberships are great for experience gifts. Let's move on to OUTDOOR gift ideas. 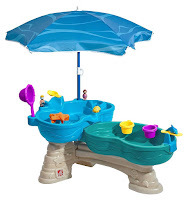 Water table - Water play is so much fun for kiddos and even if they have to wait a few months for warmer weather, a water table makes the perfect gift. We have this one from Step 2 and love it. 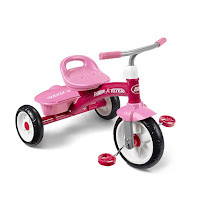 Tricycles - As your little one gets older, it's time to begin introducing tricycles! 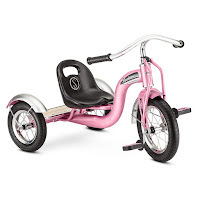 We have both (or are getting both from family) the Schwinn and Radio Flyer. Picnic table - My little ones love having picnic lunches outside during the summer. 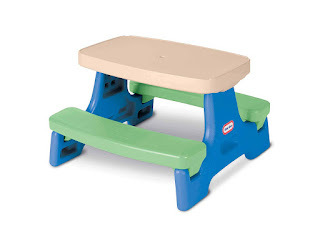 This picnic table by Little Tikes is perfect for that. 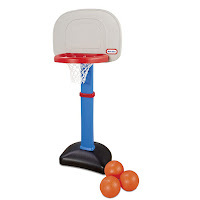 Basketball goal - This basketball goal by Little Tikes is the perfect starter set for a young basketball player. My girls watch their older brother play basketball, so I know they'll love getting to play it themselves. 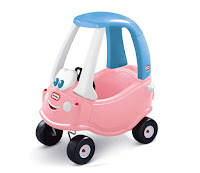 Little Tikes Cozy Coupe - This is a classic and it is so much fun for little ones! We were gifted this princess edition, but the traditional red/yellow is just as sweet. 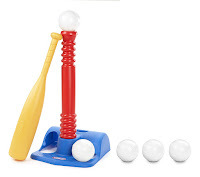 Little Tikes T-Ball set - This is another cute beginner athlete set. My son loved this when he was young. To this day, baseball is his favorite sport! Now let's move on to INDOOR/MULTI USE gift ideas. Little Tikes Mini Trampoline - We recently received this gift and my two year olds LOVE it. Play kitchen - Our little ones will soon receive a kitchen and I cannot wait! 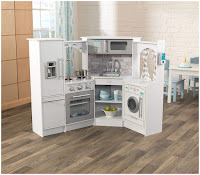 A play kitchen was one of my most loved toys as a child and I cannot wait for my littles to enjoy one. We decided on this Kidcraft play kitchen. We decided on a corner kitchen since our space allows it and it looks big enough for 2 to comfortably play. 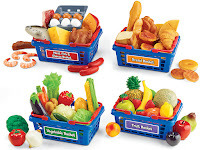 Play food - If you go with a play kitchen, you'll need accessories like play food. We debated on wooden vs. plastic play food. In the end, we decided to go with plastic, but we knew all plastic play food isn't made the same. I loved the durability of the play food at our local children's museum. It is from Lakeshore Learning, so we invested in it. IKEA Flisat table - This table is PERFECT for sensory play, which is what we plan on doing with it! We purchased the white Trofast baskets to go down inside the Flisat table. 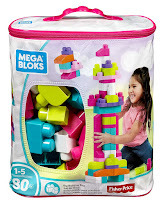 Mega Blocks Lego set - This is a classic beginner Lego set. 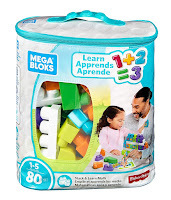 They come in primary colors, pinks, and they even have a stack and learn set. 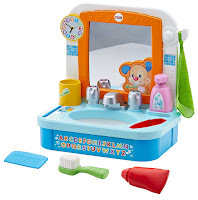 Fisher Price Laugh & Learn Sink Toy - This has been a favorite toy of my littles for well over a year! It is great to teach the very beginning stages of brushing teeth, combing hair, and washing hands. 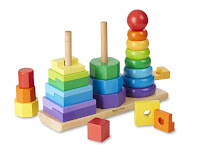 Melissa & Doug Geometric Stacker - I originally was looking for a simple circular stacker, but found this set from Melissa & Doug and grabbed it. 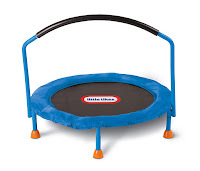 It is great for hand/eye coordination and fine motor skills. 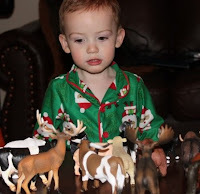 Toy animals - We bought a ton of animal figures from Hobby Lobby when my son was two years old. Six years later, they are still in GREAT condition and have proven to be WELL WORTH the investment. I recommend a high quality set that will last for years. Puzzles - My favorite puzzles are from Melissa & Doug. They are such good quality that lasts. This farm animal puzzle is a favorite of ours. 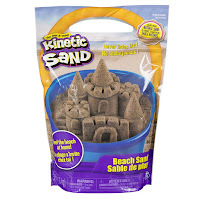 Kinetic sand - Kinetic sand is so great for sensory play. We use it often! 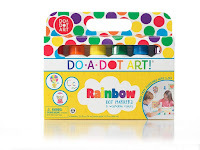 Do-A-Dot markers - These markers are great for crafts! We use them with printable Do-A-Dot sheets online. 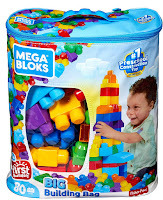 Great for hand/eye coordination! Dress up - Superhero capes, princess dresses, etc. What's not to love?! We are dedicating a spot in our playroom just for dress up. 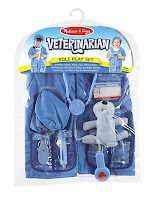 We have a Minnie Mouse dress up set, a Riverbanks Zoo vest, a superhero cape, and a veterinarian vest. Play Doh - I know, it's messy. Little pieces of it get everywhere no matter how careful your children are. I like to throw down a sheet before we play so that (hopefully) all of the remnants stay on the sheet. Play Doh is GREAT for sensory play. 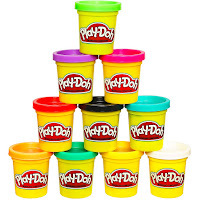 We also like the Play Doh tools. There you have it! LOTS of gift ideas for toddlers ages 1-3! I hope this was helpful to you. What items are on your list for your little ones? 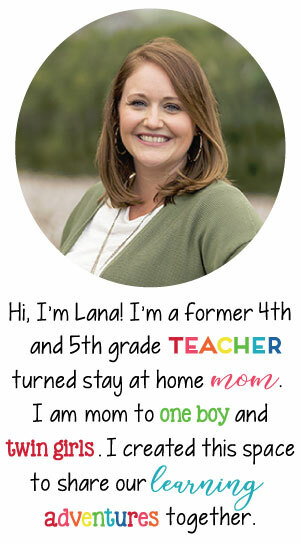 Be on the lookout for my next gift guide --> boys ages 8-9!